During the past five years millions of Syrians have fled their homes, hoping to escape the fighting that has devastated the country and resulted in the deaths of hundreds of thousands of civilians. Though many have made the trip to Europe, most refugees do not leave the region and end up at camps situated in Turkey, Lebanon and Jordan. The Azraq and Zaatari camps in northern Jordan are now home to more than 100,000 people. The latter was built in 2012 with the intention of temporarily housing 5,000 people; one year later 150,000 had settled there. 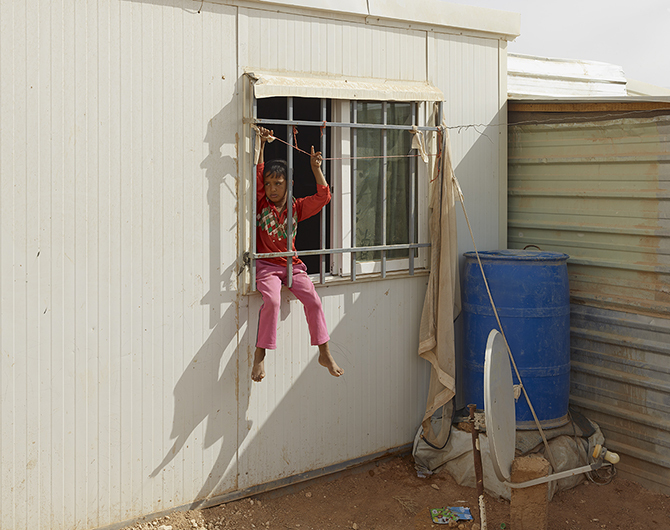 The 80,000 refugees that currently live in Zaatari have seen conditions improve over time and development continues. Current and coming projects will introduce better water supply, sewage systems, internet access and solar power. Thousands of small shops offer most of what one would expect to find in a fixed city’s shopping district. Unlike Zaatari, the Azraq camp was intended to be a long-term settlement. It could accommodate 100,000 residents but only has 30,000 as of April, 2016. Inhabitants of both camps have benefited from a flood of donated clothing, supplies and better food. I spent five days in the two camps during Ocober 2015.